This has easily been my most anticipated record of 2016. And to explain why, we need to go back to 1978 and an independent country release called White Mansions. Written by singer-songwriter Paul Kennerley, it was the rarest sort of release in country music: a narrative-driven concept album containing multiple artists each playing a distinctive part. This was in the height of the outlaw movement, and as such recruited artists like John Dillon, Steve Cash, Jessi Colter, and Waylon Jennings himself, even pulling on Eric Clapton to play guitar on a few tracks. And while the tighter budget definitely shows at a few points, the ambition was unmistakable: this was the story of the Civil War from the South's point-of-view, but pulled zero punches about the roots of the conflict and the deep, lingering scars left on the American psyche, especially in the South. I can say bluntly that the political fallout would make such a record impossible to make today - and I can say without hyperbole that it is a classic country album, and if you're lucky enough to find a copy, I can't recommend it highly enough. So why is any of this relevant? Well, if you've been watching the resurgence of outlaw country around the edges of Nashville, you shouldn't even be surprised. Over the past two to three years and the increasingly sterile and meat-headed modern country scene, the independent country scene has expanded like never before. Part of this is the rise of the Internet allowing local acts to gain groundswell, but at the epicenter is one incredibly gifted producer whose hands have touched most of the best country records of the past several years: Dave Cobb. Now I've raved about this guy a number of times on my channel - and if you know his production background you'll understand why - but what you probably don't know is his work behind the scenes, becoming the new caretaker of the legendary Studio A in Nashville and establishing his own publishing imprint, which gives him the ability to foster greater talent. Of course, it's also helped matters that he's produced some of the biggest indie country albums of the past few years, from Sturgill Simpson to Jason Isbell, from Lindi Ortega to the Grammy-winning debut album from Chris Stapleton. And all of this has given him the clout and budget to pursue the sort of passion project country fans don't dare to dream about: a concept record inspired by White Mansions with the sort of line-up that would seem impossible. Let's run through the list: Jason Isbell, Chris and Morgane Stapleton, Jamey Johnson, Brandy Clark, Holly Williams, Brent Cobb, Anderson East, Shooter Jennings, John Paul White formerly of the Civil Wars, Rich Roberson of the Black Crowes, and not to completely exclude the mainstream, Zac Brown and Miranda Lambert. This is an Ayreon project for country music from one of the best producers in the industry, which meant that while this is my most anticipated project of 2016, it was also the one where I had the highest of expectations - could Dave Cobb pull this off? Well folks... honest to god, I've put off this review for a number of days, because I was struggling a lot to figure out how I'd rate it. Because make no mistake, not only is there not a bad song on this record, I'd argue at least half of the album I'd describe as outright incredible and contenders for my favourite songs of the year. And yet, is it worth that perfect score that I don't think I've ever awarded on this channel? Well, let's find out. Now when you consider compilation albums like this, the first immediate question comes in the talent brought on board, especially when you have so many disparate and defiantly unique voices. You have some that are coming from a much rougher country tradition like Brent Cobb and Anderson East and Morgane Stapleton and Holly Williams, where the rasp and bite in their voice shows a weathered presence that adds real texture. And yet on the other side you have the much smoother, borderline neotraditional country tones that you'd get from Zac Brown or Brandy Clark or even Jamey Johnson playing a more subdued tone absolutely beautifully. And then you have the middle ground: John Paul White opting for some of the most soulful vocals of his career that he never showed off as well when he was with The Civil Wars; Jason Isbell's wry delivery that underscores the cleverness in his songwriting, Miranda Lambert sounding more at home in country than she has in years, and Shooter Jennings... well, look, he'll never have his father's pipes in the same way, but his exuberance comes at a critical point on the album that really cannot be overstated. And everyone here is at their best in their respective ranges - and make no mistake, some of this material is not easy to pull off well. Now we'll come back to content in a bit, but it's key we focus on instrumentation and production. And having been through this album so many times... I can't find any flaws. I'm as stunned as anyone, but there's not a single instrumental moment that goes awry, not a single texture or production choice that feels out of place within their respective tracks. Now I'm adding that qualification because in terms of the country sounds that Cobb introduces, this record really is all over the map, sometimes going right to the fringes of what would be defined as country, especially with the meatier electric guitars that shows up on 'You Are My Sunshine' or the blues and soul touches of 'Learning' complete with prominent bass and horns or the country rock rollick of 'Can You Come Over' or the outright gospel of 'The Way Home', anchored on a rough-edged, fuzzed out guitar lick that is perfectly balanced to bring in that country touch. Now those of you who might have been worried that the 'vintage' touches that have shown up on Dave Cobb's production might overtake this record... well, they do come up in a few places, most notably in the strings texture that fleshes out the background of 'Simple Song' or 'Sweet By And By' or 'I Cried', but they never compromise the fidelity of the recording, which is crisp, clear, and full of some of the most gorgeous textured melodies you'll hear this year. And really, I find more every time I go through this album, but between that stellar fiddle on 'God Is A Working Man' to the fantastic steel guitar on 'Sweet By And By' and 'I Cried' to the subtle organ on 'Grandma's Garden' that gets some great bite on 'Learning' to the piano that anchors so many of these songs, if only just a little, the melodic hooks are always here and they never feel conventional or formulaic. And then we have the guitar work and the solos... and look, I might not have been blown away by the content on 'Down Home' or 'Can You Come Over', but the bite, texture and playing on those solos won me over regardless - although really, you then get the meaty, darker tones on 'You Are My Sunshine', with a solo that elongates the groove to a killer moment of release. But that's just the showier parts - what caught me off-guard were the quiet moments, the warmth and subtlety that show up on 'Mama's Table' and 'Grandma's Garden' in the acoustic lines, or the folk-inspired layering on 'Settle Down'. And while I could see why the horns on 'Learning' or the blasts of harmonica on 'Can You Come Over' might feel broad, they end up working as welcome moments of levity that are desperately needed. And points must be given for the track sequencing - this album can get very dark and very sad, you need those brighter moments to prevent it from dragging, and the shift in tones never creates a feel of whiplash. 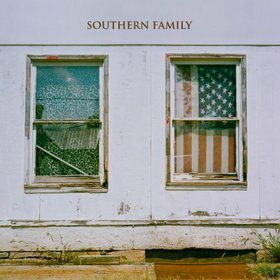 But now we have to get into content and the themes of this record, and the first thing to note is that despite this record being called Southern Family and being a country record inspired by White Mansions, the writing aims for a different target beyond the south. If anything, the greater focus is on family, mothers and fathers and grandparents and children often torn apart but trying to hold things together regardless on the traditions they want to hold dear. And yet the opening line of this album, sung by John Paul White on a song where he struggles to move past his grief, is 'You're gonna die, you're gonna die' - hand in hand, with family comes the inevitability of losing them, and this record is not going to pull punches. And while there is no narrative to the chain of deaths that runs through this record, there is a thematic throughline and arc. Jason Isbell looks at God with less awe and more like the humble common man trying to save as many as he can, but only if they want it - in other words, probably closer to the Gospel than most modern religion. And while Brent Cobb sees minor tensions brushed away in the sanctuary of a simple home, Miranda Lambert follows it with warnings to cherish that family and home, because it can so easily slip away, a warning that'll manifest in two distinct ways throughout this album: the internal crises that we can control, and the forces of nature we cannot. Hell, it's one of the reasons the inclusion of Morgane Stapleton's cover of 'You Are My Sunshine' is kind of ingenious at this point of the album: normally a lullaby and profession of love, but she goes with the full version and plays with much darker, minor tones, almost implying a threat should her partner ever leave her, an arc that'll later resurface on 'Learning' as Anderson East's father sees his marriage collapse and come to the realization he's still learning how to be a man just as he teaches his son - a moment with real punch when you consider how valued that patriarch is in the South. Go a step further and you see the relationship sputter naturally with Holly Williams' 'Settle Down', which ends on a deeply somber note that despite the breakups and makeups, there's still that insecurity. On the flip side, though, there are some endings that are plenty certain, which takes us to the surprisingly affecting 'Grandma's Garden' from Zac Brown. And here's the thing about that song: sure, it's a little corny in the garden metaphor, but I remember when my own grandfather passed away a few years ago, and when I did the eulogy, a lot of my own references were coached through very similar, very simple language - making things smaller in order to build emotional context and remember the best of times. It's why Jamey Johnson's understated take on 'Mama's Table' has impact, showing both good times and bad lodged in the little things, or the absolutely devastating 'I Cried' from Brandy Clark as her grandmother struggles to move on from her grandfather's death - because in the end, you're gonna die. But then we have the ending, and putting aside Shooter Jennings' brief - and welcome - moment of respite, which seems to come from the evolving perspective of a kid growing in that world - the album closer 'The Way Home' begins with the sounds of the road ahead as the guitars and organ peal out. Perhaps after coming home to the south to reconnect and find that sense of place and family in the face of death, eyes are turning to the opening road and the path ahead. And then the gospel choir comes in - rough around the edges but still soulful - with the mantra that even in the face of inevitable death, they've got a seat up in Heaven, and everything's gonna be alright. You should hold onto family and tradition and those little things that tie us together, but there's a way to let them go. Death might be inevitable, but there is a way to make it bearable, and even as fragile humanity pulls us apart, you can still hold onto hope. Folks, at this point I'm struggling to find criticisms of this album. The closest I can find is that songs like 'Down Home' and 'Can I Come Over' feel a little trite in the subject matter, not quite having the same meat as the best here, but not only do the songs serve a valuable purpose in establishing the atmosphere and tone, they're still damn great country songs on their own, all contributing to the sound and colour of the record. On their own records they'd probably show as better - only here are they not standout tracks, but that's because the talent is goddamn ridiculous. And sure, I could wish for more of a concrete narrative or for Sturgill Simpson to have shown up, at the end of the day Dave Cobb and his collaborators put together one hell of a record. So much personality and texture and emotive power... this is a record that shows exactly why I love country music. Even if you don't like country music, I'd still recommend this on the basis of compositions and writing, with the variety almost guaranteeing you'll find something to love. For me, though... while there is no such thing as a perfect record, there's a place for acknowledging the very best: TEN. If that's not an endorsement of probably what will be the best album of this year, I don't know what is.
' Great revue.....you may be interested in my version of the White Mansions album..... or more!